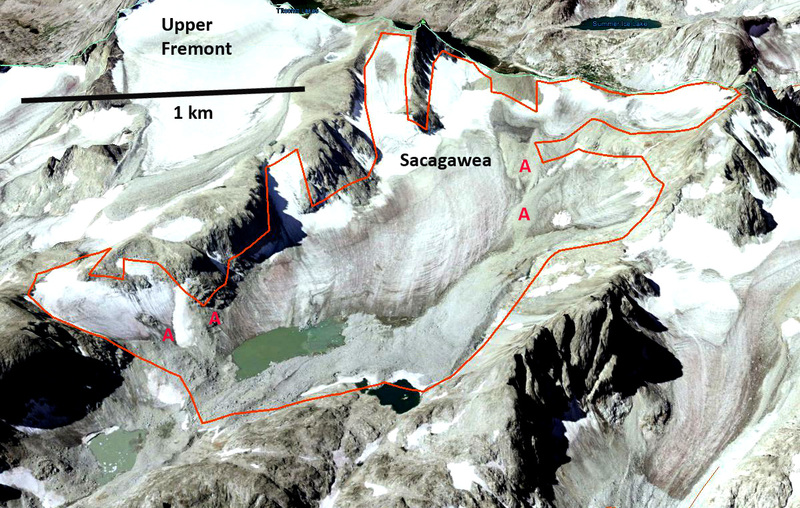 Sacagawea Glacier in the Wind River Range of Wyoming lost 35% of its area between 1966 and 2006. This glacier on the west slope of Sacagawea Peak and Helen Peak and just north of Upper Fremont Glacier. Here we compare Google Earth imagery of the glacier that indicates the change during this forty year period. In 1966 the glacier had an area of square kilometers. The first image is the USGS map of the glacier from 1966 imagery. 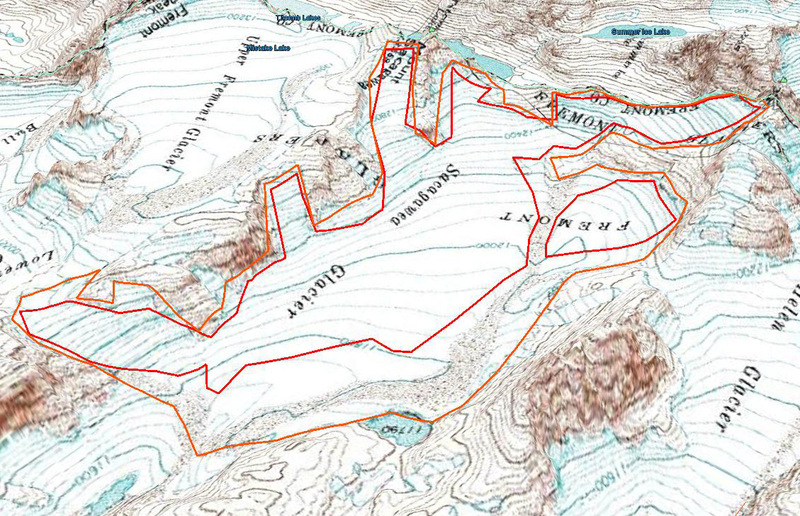 The orange outline is the glacier margin at this time and the red outline the 2006 glacier boundary. By 1994 Google Earth images indicate a retreat of 270 m along its main terminus. A small lake has also begun to form along the southern section of the terminus. The northern section of the glacier below Helen Peak had by 1994 become practically disconnected from the main section of the glacier. In 1994 the exposed blue ice area is extensive, indicating that most of the glacier was consistently losing its snowcover. With retained snowcover limited to the steeper slopes above 3700 m. By 2006 the lake was 400 m long and 150 wide along the southern section of the terminus. The terminus retreat along the main terminus averaged 350 m since 1966. The northern section of the glacier is fully detached from the rest of the glacier. The fraction of snowcovered area is 10% in 2006, which was typical for the 2003-2006 period. 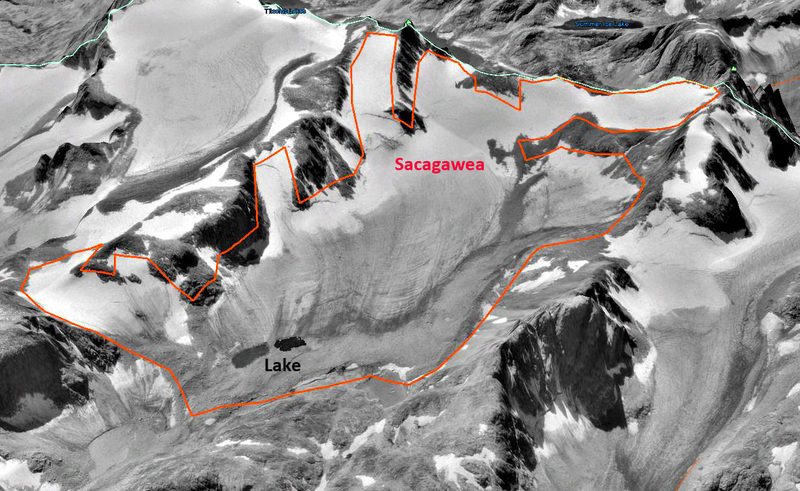 This is insufficient to maintain a glacier, the snowcovered area for temperate alpine glaciers such as the Sacagawea that lacks extensive avalanching is 55-65 % snowcover at the end of the melt season. The locations marked with Point A in red are locations where rock formerly beneath the glacier has been exposed as the glacier melted from that location. 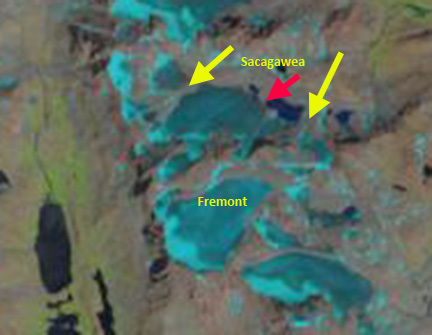 By 2013 a Landsat image of the glacier indicates that the glacier is beginning to recede from the terminus lake, further that there is almost no retained snowcover in 2013 and that the glacier is separated into three segments note the yellow arrows. The upper margin of the glacier is receding which indicates thinning in the accumulation zone, an indicator that this glacier does not have a significant accumulation zone and cannot survive current climate (Pelto, 2010). In a Planet Action Project Pelto (2010)reported that 2/3 of the 15 Wind River glaciers examined were not going to survive current climate. This includes Minor Glacier, Sourdough Glacier, Grasshopper Glacier and Lower Fremont Glacier. This entry was posted in Glacier Observations and tagged glacier disappearing, Sacagawea glacier retreat, wind river glacier retreat, wyoming glacier retreat. Bookmark the permalink.